Meiji Shrine is an oasis of shade and silence within the buzz and bustle of young Tokyo. 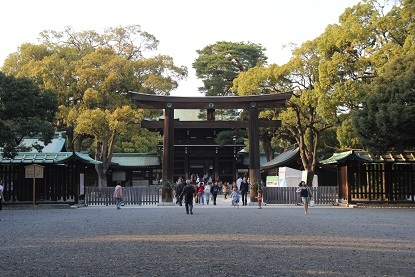 Located only minutes from the youthful centers of Harajuku and Shibuya, the wooded entrance to the shrine instantly soothes the mood, as visitors crunch softly forward over a gravel walkway. At 720,000 square meters, the woodland grounds are 1.5 times larger than Vatican City in Rome and contain over 120,000 trees donated from all around Japan. The 12-meter torii　in Japan. New Year’s Day at Meiji is one of Tokyo’s most celebrated traditions and the shrine is also a favorite spot for kimono photos on Coming of Age Day, later in January. The Meiji Shrine―the shrine of Emperor Meiji, whose legacy was bringing modernizatinon to Japan―is one of Tokyo’s premier sights. The vast and shaded woodland area―over 700,000 square meters―makes the shrine perfect for an afternoon stroll, with the landmark structure being not the shrine itself but rather the torii gateway at the shrine’s entrance. At 12 meters high, it is the tallest wooden torii　in Japan, made of 1,500-year-old cypress trees from Taiwan. A second, similarly-sized torii　stands at about halfway along the walk to the shrine buildings. The shrine itself was dedicated in 1920 and rebuilt in 1958, after being destroyed in World War II. The first three days of New Year are a festival everywhere in Japan, as businesses close and people visit friends and family to wish them well for the year ahead. Most people also visit a Shinto shrine to pray for blessing, and no shrine is more famous for this than Meiji―where approximately 3.5 million people will swarm to the shrine in just those three days. For the hardy of spirit, the challenge is to be at the shrine to welcome the New Year at the stroke of midnight. One must be hardy because close to a million people will have the same idea. While the prayer before the shrine is a solemn moment, the overall atmosphere is festive and relaxed. As always, streets are lined with food stands.